I hope you receive Liberty's picture OK. He is doing just great and has settled in very nicely. He is such a lovable Golden and loves to sit in the recliner chair with me and cuddle. He is very fond of his marrow bones and has adjusted well to his crate. He's had a few visits to the Grooming Gallery and does OK with that. Liberty follows me to the shower and sits outside and waits for me! Joe and I just love him and are so grateful he came into our lives! Hope you are well and enjoying the spring. I'll write again. Dear Irene -- We're thrilled to hear how well things are going with Liberty. And thanks for the photo! Thank you for Buddy and Pumpkin. They are doing great. Pumpkin's new best friend is her tennis ball -- she carries it with her everywhere and sleeps with it. The boys -- Rusty and Buddy -- torment her when they can get the ball and play keep away. Both B&P got check-ups after I received them and Buddy's head, which was slightly infected after surgery, is healing very well. Pumpkin is showing signs of a waist as is Buddy. They love to chase anything you can throw. I won't call it fetch because I usually have to go after them to retrieve the ball. They wait for me to come to them so they can chase some more. They are so comical and a joy to have. Pumpkin loves to be hugged and Buddy is always there for his share! They have helped Rusty -- now over 13 -- act a young 12. So all is wonderful. They have visited the store but have not "worked" yet. I will send pictures as soon as my camera is back from repair. Thanks again for giving me this opportunity to share in B&P's lives. Dear Marie -- Sounds like B&P are a wonderful addition! We look forward to seeing photos of them "working!" I can't believe it's been 2 years since we adopted Chrissie -- it seems like she's been part of our household forever! She is absolutely the best! And while I may be a bit biased, countless friends ask when I'm going away so Chrissie can stay with them ... but in most cases, she travels with us. In April we're driving to Hilton Head -- her 4th trip in 2 years -- she's not too pampered! Every day with Chrissie is a joy ... and this coming at the end of a stormy winter when she still went on 2 long walks a day! Chrissie is the 4th Golden that my Mom and I have had, but the first girl ... so we do have some Golden experience -- but Chrissie is special -- and very loving -- in fact, we won the kissing contest at the reunion in September and she kept kissing me all the way home. Here's my annual donation -- a dollar a day is a small price for all of the joy that our girl brings us. Keep up the great work! Dear Ruth & Pat -- Thanks so much for the very generous annual donation. And thanks for giving Chrissie such a loving home! Thank you for the beautiful letter and all the information from GRRI. Thanks most of all for Jack. We absolutely adore him. 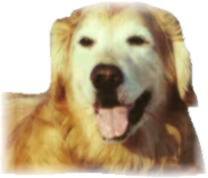 He is gentle, loving and so typically Golden ... he's beautiful. He's living up to his name ... retrieving as many things as he can! He's traded in his crate for a nice comfortable chair, with pillow (of course) and feels right at home. 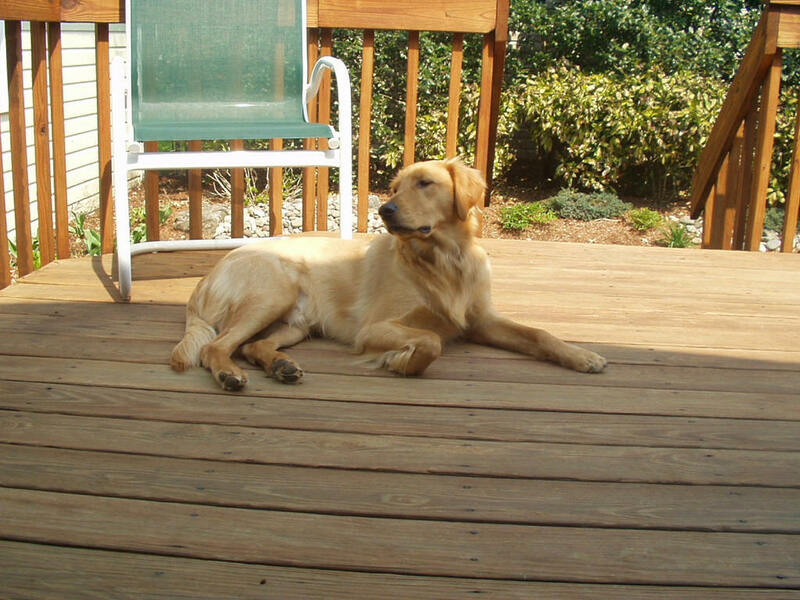 He has brought our home back to life and has allowed our dear Murphy's legacy to now live on, through Jack. 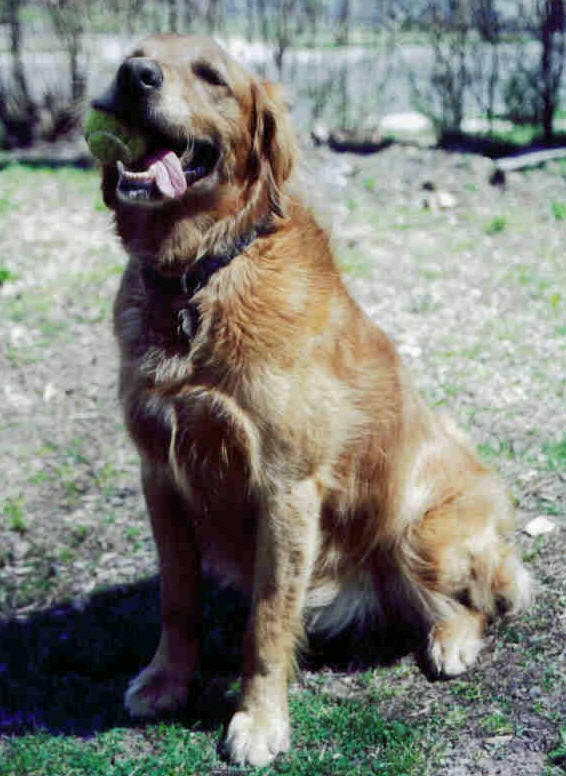 (After reading The Last Will and Testament of a Very Distinguished Dog, we understand the importance of adopting a dog as a tribute to Murphy). Here's the papers from Dr. Ashman. My husband spoke to him today, and YES, the SNAP test was done, and Jack's lyme negative. We're setting up his DHLPP booster and mini profile. Thank you for everything and we'll be keeping in touch with you. Dear Laura -- We're so pleased to hear how much you adore Jack. And isn't that just the most remarkable book? 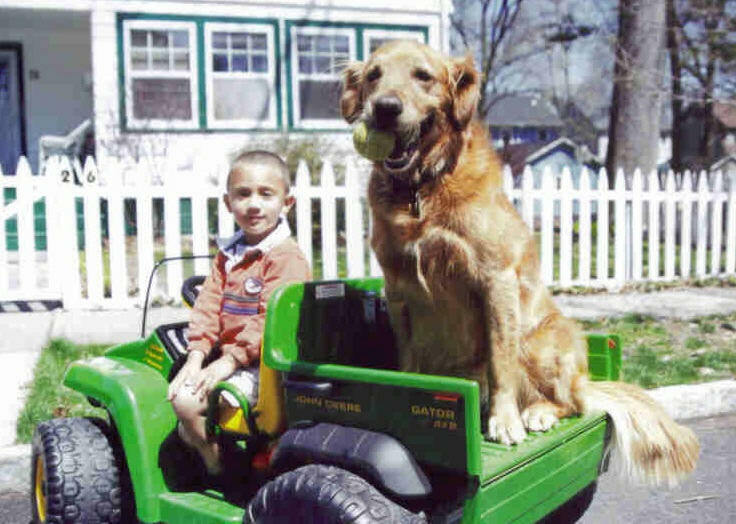 Enclosed you 'll find a couple of adorable pictures of our beloved Golden, Dusty, adopted back in 2001. He loves retrieving tennis balls and as you can see, playing with our 3-1/2-year-old son Adrian. I hope you enjoy them. Thank you for giving us the chance to have a loving, playful, caring member in our family, Dusty. Dear Alexandra -- That picture of Adrian and Dusty is priceless! Thanks so much for sending it! Dear Adele -- So good to hear that Rosie is recovering from the Vestibular problem! It happens to older dogs and can be very scary. Extra kisses to Rosie from all of us. We LOVE hearing from our adopters!